DETAILS: Flat Washer, SAE, Steel, Finish Zinc, Fits Bolt Size 3/8 In., Inside Dia 13/32 In., Outside Dia 13/16 In., Thickness 0.0625 In., Thickness Tolerance +0.05/-0.08 In., Package Weight 0.62, Package Quantity 100. 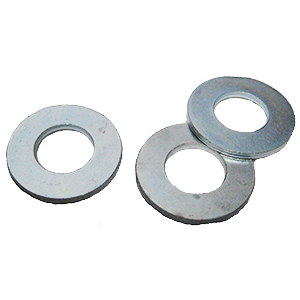 5/16 inch ID Flat Galvanized Steel Washer (fits 5/16 bolts), SAE Grade. 100/Bag. Price/Bag.